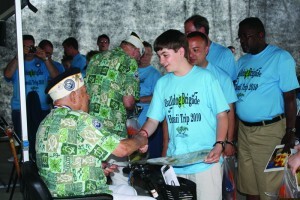 Many bands connect with a Pearl Harbor Survivor in their area preceding their trip. Classes, presentations and visits are an outreach that give students a first hand introduction to the attacks on Pearl Harbor and World War II. 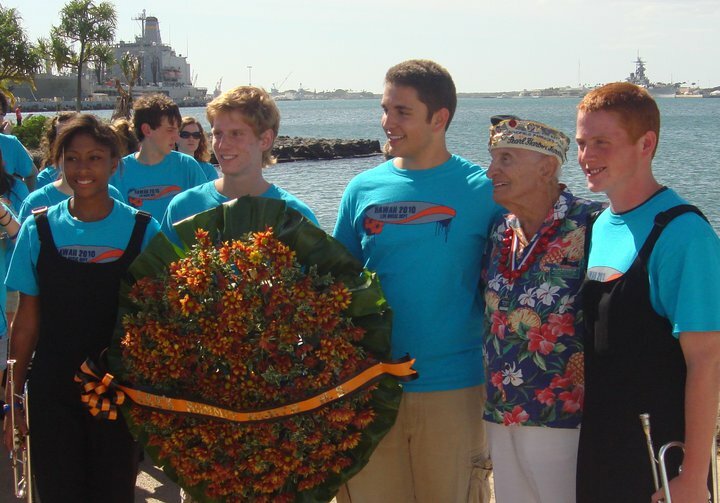 Survivors often travel to Hawaii with the bands, where they participate in the band’s visit and wreath laying ceremony at the USS Arizona Memorial and performances at the USS Missouri Battleship. Local and visiting survivors are honored in the Waikiki Holiday Parade. Most survivors ride in convertible cars ahead of their host band. It will truly touch your heart to watch as the crowds rise to their feet with applause and salutes for each passing survivor and veteran! Over one and a half million visitors each year experience the power and reverence of Pearl Harbor. Precious artifacts, documents, photographs and personal memorabilia that had been in storage for years, never seen by the public, are available to view in the newly renovated visitor center. Continued support is required for maintaining the center. For every band that participates in the Waikiki Holiday Parade, a donation is made to the USS Arizona Memorial, helping preserve Pearl Harbor history. The Waikiki Holiday Parade has donated over $30,000 to the USS Arizona Memorial. Fundraising programs allow teachers to combine curriculum and community service with student participation and creativity. If you are interested in additional ways to fundraise for Pearl Harbor and get your entire community involved, please contact us.